During his 32 years as university instructor, his classes at the University of Alaska consistently had the highest positive student evaluations in his college. Now you too can experience his teaching at first hand thanks to his 12 hour 6 DVD Kundalini Yoga for Beginners, a fully accredited university course, and brought to you by Yoga Technology. This course also forms an integral part of our Complete Course in Kundalini Yoga. 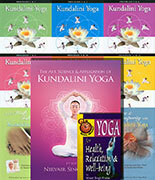 As well as his Beginners’ Course, Nirvair Singh’s Kundalini Yoga DVD titles include Heal Your Back Now, Weight Loss with Kundalini Yoga, Early Morning Sadhana with Kundalini Yoga, Kundalini Yoga for Relaxation, Morning Stretch Evening Relaxation, Grace and Prosperity with Kundalini Yoga, Walk Tall with Kundalini Yoga and Kundalini Yoga for Athletes. His two leading book titles are The Ten Light Bodies of Consciousness and Art Science and Application of Kundalini Yoga. He has taught over 11,000 classes attended by over 275,000 students in his career, including seminars, classes and retreats all over the United States and in Mexico, Italy, France, Russia, and India. Nirvair, Co-founder of the Kundalini Research Institute, is now its CEO, and serves on the Board of Directors of the International Kundalini Yoga Teachers Association. Yogi Bhajan honored him in April 2005 with the title Mukhia Singh Sahib, an honorary title indicating an elder in the Sikh Dharma International Ministry, and one only given to those who have done exceptional service to the community. Nirvair Singh Khalsa lives with his family in Santa Fe, New Mexico, having relocated from Anchorage, Alaska. He still vacations there, where he loves to run, ski, bike and hike in the mountains with his family. Below you will find our selection of products by Nirvair Singh. Enjoy our low prices and FREE US Shipping.